When the weather's nice outside like it is during summer, there's really no excuse to not get out and enjoy it. The allure of air-conditioning may be strong, however sunshine on your skin and fresh air will do more to perk you up than any caffeinated drink during post party-season fatigue. If you're not one to simply lie on the beach and you fancy seeing the world from a slightly different angle, I have the perfect activity for you! 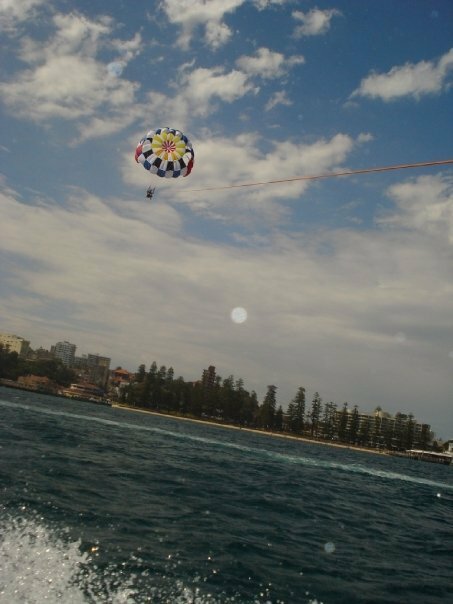 Manly Wharf offers Parasailing from October through to April for people over the age of 10 and it is a fantastic way to spend an hour or so solo or in tandem with a partner. Solo parasails start from $85 and tandem sails (two people hoisted into the air together) are $139. I went on a parasail with a friend from the Gold Coast and it was a fantastic way to show off this wonderful city we live in. Essentially in one fell swoop I gave him a boat cruise, a dunk in the ocean (you can advise the captain if you don't want to be dipped in the water mid-sail) and an amazing view, all in addition to a mini adrenaline rush. I had thought the process of being released behind the boat would be turbulent, however it was extremely smooth and once aloft the world seemed peaceful and quiet. The view was incredible, prompting the retrieval of my camera to take a few happy-snaps. 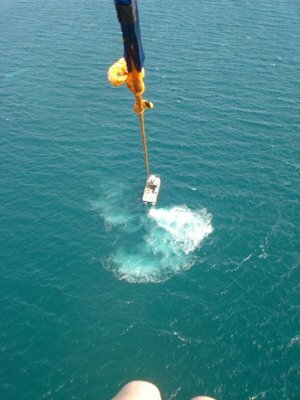 We trailed aloft behind the boat for roughly ten minutes before being lowered back on board. Whilst ten minutes sounds short it was actually plenty; you feel that time is almost suspended whilst you're aloft. Four different pairs went up over the course of the hour and being on the boat was equally enjoyable to being aloft, as it was nice to watch the others and just enjoy the spray, sounds and smells of being out on the water. 1) Tie back long hair (nothing worse than it smacking you in the face on the boat). 2) Wear sunscreen to avoid a post-sail burn. 3) Take a dry set of clothes if you plan to get dunked (and tell the captain if you don't want to). 4) Take something to drink - an hour can be a long time if you're thirsty. 5) Don't wear a dress/skirt. 6) Ensure your camera has a strap to avoid being dropped from a height - and hold it up if you're going close to the water! Whether a local or a visitor I would highly recommend taking to the skies, particularly if you want to impress a special someone (although not if they have a fear or heights). Sharing a view that no-one else has at that point in time should ensure it's a date to remember. Why? 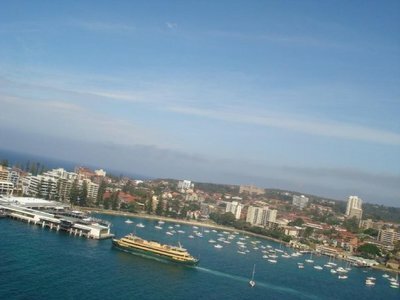 Do something different at Manly and take to the air! I think i'll be giving this one a miss. Well written article.